Here’s the 6th part Nasir’s tutorial on transformers. Enjoy and leave your impressions. Don’t forget you can send your own articles, works, reviews or tutorials; just send us a mail! A Centre Tapped transformer works in more or less the same way as a usual transformer. The difference lies in just the fact that its secondary winding is divided into two parts, so two individual voltages can be acquired across the two line ends. The internal process is the same, which is when an alternating current is supplied to the primary winding of the transformer it creates a magnetic flux in the core, and when the secondary winding is brought near, an alternating magnetic flux is also induced in the secondary winding as the flux flows through the ferromagnetic iron core and changes its direction with each and every cycle of the alternating current. In this way an alternating current also flows through the two halves of the secondary winding of the transformer and flows to the external circuit. When an additional wire is connected across the exact middle point of the secondary winding of a transformer, it is called a center tapped transformer. The wire is adjusted such that it falls in the exact middle point of the secondary winding and is thus at zero volts, forming the neutral point for the winding. This is called the “center tap” and this thing allows the transformer to provide two separate output voltages which are equal in magnitude, but opposite in polarity to each other. In this way, we can also use a number of turn ratios from such a transformer. As it can be seen from the figure that this type of configurations gives us two phases through the two parts of the secondary coil, and a total of three wires, in which the middle one, the center tapped wire is the neutral one. So this center tapped configuration is also known as a two phase- three wire transformer system. In this way, half the voltage appears across one half of the phase, that is from line 1 to neutral, and the other half of the voltage appears across the next phase, that is from neutral to Line 2. If the load is connected directly between line 1 and line 2, then we get the total voltage, that is, the sum of the two voltages. This way, we can get more amperes of current at the same voltage. 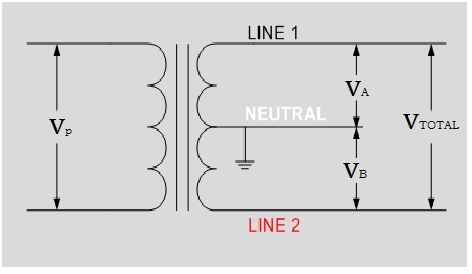 The two voltages, between line 1 and neutral and between neutral and line 2 can be named as VA and VB respectively. Then the mathematical relation of these two voltages shows that they are dependent upon the primary voltage as well as the turn ration of the transformer. One thing that should be noted here is that both the outputs VA and VB respectively are equal in magnitude but opposite in direction, which means that they are 180 degrees out of phase with each other. For this purpose, we also use a full wave rectifier with a center tapped transformer, to make both the voltages in phase with each other. The primary difference that is evident here is that a normal transformer provides you with only one voltage, for example, say 240 V. But a center tapped transformer will provide you with two voltages each of 240/ 2 i.e. 120 V, so that we can drive two independent circuits. In the coming part of this tutorial, we will discuss the multiple winding transformers in which we will discuss its working, construction and the purpose. So stay tuned to us and also subscribes us via email to get these burning tutorials right into your mail box. what are the limitations of centertapped transformer??? TUF of center-tapped transformers in full-wave rectifiers (0.693) is less than that of ordinary transformers in bridge rectifiers (0.812). Saturation of core is another drawback of this type of transformers as only one sided flow of flux is allowed which causes early core saturation as compared to ordinary transformers in which opposite directional flux cancels net effect. It is a fact that in center-tapped transformers half of the secondary coil is used at a time, while the other half remains unused. This results as a reduction in the efficiency and therefore ordinary transformers are regarded as more efficient. Center-tapped transformers give half of the voltage across its secondary as output. In other words rating of a center-tapped transformer has to be twice of the desired output. Therefore center-tapped transformers are costly and occupy more space. I want to step up the utility voltage (230Vrms) by 1:2 and rectify it. I was thinking of using centre tapped transformer as a full wave rectifier. But now I see that a bridge rectifier and simple transformer (1:2 without centre tap) will serve my purpose easily giving me relaxation in designing the transformer. For a centre tap design I have to use more turn ratio for secondary windings(size + cost of centre tap will increase). Am I true in my approach? Which scheme will be better? How to calculate T.U.F of a full wave rectifier uaing centre taped transformer. I want full calculation. Nasir – This is incorrect. You seem to get this right earlier in your comments. There are in fact 3 different circuits from the centre-tapped transformer. This is typical of North American distribution systems, where there are two 120V circuits, and one 240V circuit (two live conductors, one neutral conductor). The 240V circuit is made up of the summation of the two 120V circuits. Yes, the 120V circuits are opposite in polarity, but if you were to measure between the two live conductors (Vtotal) you would have 240V (and in phase with Va). This is easily shown using basic circuit theory. Some poor soul is going to read your comments and end up electrocuting themselves. To the public community – this goes to show that the only way to receive a proper education in Electrical Engineering is to attend a real university. Nasir – it is my only hope that you think twice before posting ‘theory’… your diagram doesn’t even show the polarity of the voltages to begin with. How about you try showing this with phase angles and prove your comments through equations? Prove that Vtotal is the summation of Va with Vb using example voltages. What would happen if the neutral conductor is broken? I know all the answers to this because I am actually an Electrical Engineer specialising in power system protection. I’m sick of wannabes that give us real Engineer’s a bad name. It is a respectable profession and we take pride in our work, because mistakes can result in death. Then we’d be happy to have your contribution and to receive your own observations and articles/tutorials. You can reach us by mail. What are the disadvantages of Center Tapped Transformers? What are the disadvantages of Center Tapped Transformers to the distribution system? I am also a EE. “Guest User”, you are not wrong, but there’s no reason to be so disrespectful. Calling Nasir a ‘wannabe’ is rude and not necessary. You’re just confirming the stereotype that engineers have no social skills and, judging by the way you use apostrophes to pluralize words, poor English skills as well. I need two voltages from a centre tapped transformer. I built a bridge rectifier and got 600 volts with reasonably little ripple after filtering. From the centre tap I took 300 volts DC but because it isn’t filtered it is noisy when used in my modulator. (I assume this is because the centre tap contain raw AC as well as the residual Dc component which is about .45 of RMSV)It runs the receiver fine but in the modulator there is enough draw the noise is objectionable. How can I filter the 300 volts without bothering the 600 volts. Should I instead forget the diode bridge and build a full wave (two diode ) rectifier for the centre tap and a similar rectifier filter for the one outer end and ground the other outer end giving me two independent outputs (won’t bother each other except load is load and will sag voltage but I understand that) Please dear engineers , give me a straight forward answer (no hypothetical goobly gook.) Efficiency I don’t care about. When I use a rig for a few hours per year talk of efficiency is simply nonsense to me. I am using a Hammond transformer 600 volt CT capable of 288 mils supply. It is powering a WWII tube tranceiver (No 19WS) I have it working but need a quieter supply on the 300 volt. We use a normal Tx for our compressor control voltage (110VAC). The client has request for a centre- tapped Tx to meet mining requirements. We have purchased a 55-0-55 for this application. Why will someone opt for a centre-tapped if they are only going to use 110VAC?